It's no secret that I like samplers. Last year I was lucky enough to be invited to design a block for The Splendid Sampler quilt along. For those of you who are new to this project, The Splendid Sampler is a year long quilt along hosted by Pat Sloan and Jane Davidson. The 100, 6" blocks cover techniques like precision piecing, embroidery, appliqué, english paper piecing and foundation paper piecing. 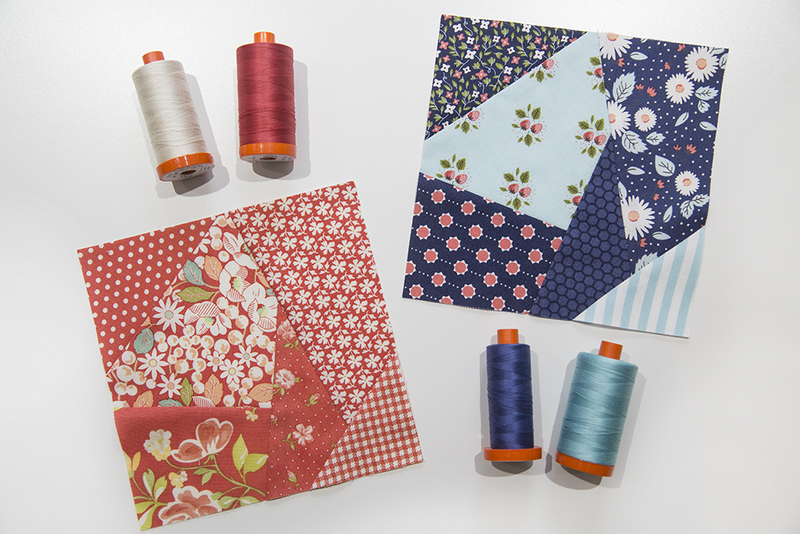 Two block patterns are released each week. Today is my special day for the quilt along. :) I designed a block called Whim. This block finishes up at 6". Whim was inspired by improvisational quilts, but this little guy is made using a very precise method ~ foundation paper piecing. It's like faux-improv. ;) If you have never foundation paper pieced before, check out my tutorial! My two Whim blocks were stitched up using a monochromatic color scheme, but feel free to go crazy with your fabrics. I can't wait to see your finished blocks. Happy stitching everyone!